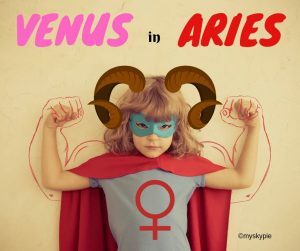 Venus, the planet of values (what WE value and desire), love and finances, enters the sign of Aries on the 20th April. In Aries, Venus is in her mythical lover’s den (one of them, the other being in Scorpio). Venus in Aries is full of bravado, actually she always gets what she wants in any sign, but her she’s more open and adventurous in Aries, sexual, but perhaps not sensuous, and certainly not “comfy” here. Aries and Scorpio are in fact the signs where Venus is in her detriment, where she is at least at ease in her surroundings. So, since Venus deals with values of some kind we might want to acknowledge that these include our self-esteem too.